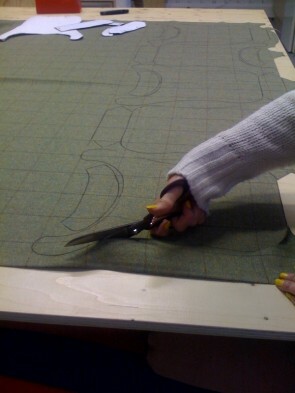 Today we are cutting the Thornproof fabric for the tweed coats which are all handmade in the UK. Our tweed fabric is woven in Scotland and originally worn by landowners and shepherds with yarn spun from the wool of the Cheviot sheep. Lilly likes using natural fabrics as they are hard wearing compared to the cheaper man made acrylics as they keep your pets warmer and with fabrics like wool they are even shower proof.